Azinam holds working interests in 6 licences across 62,000km2 of the Walvis basin offshore Namibia. Azinam’s partners on these licences include Tullow Oil, Maurel et Prom, ONGC, NAMCOR, Eco Atlantic Oil and Gas and Chariot Oil and Gas. Azinam recently announced a farmout to ExxonMobil. 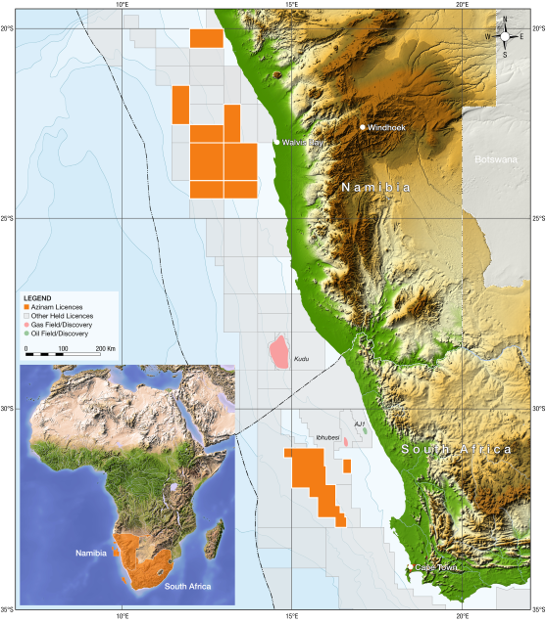 Namibia is an under-explored continental margin with significant hydrocarbon potential in two main basins, the Walvis and Orange Basin, the latter straddling the Namibia/South Africa border. Both Basins are gaining increasing industry attention from the international oil industry. Recent new entrants include ExxonMobil, Total, Lundin group (through Africa Energy & Pancontinental) and ONGC. Backed by Seacrest Capital Group, Azinam is leveraging its technical strengths to unlock the significant potential of 10billion barrels of net unrisked prospective resources on Azinam licences in the Walvis Basin. The acquisition of two new licences within the Orange Basin with will significantly enhance this position. A combination of heightened industry interest along this part South West part of Africa with wells now planned in 2018 and 2019, coupled with recent licensing and exploration success in geologically analogous regions within the South Atlantic margins, including the Falkland Islands, Brazil, South Africa and Angola, has made the region one of the most attractive potential hydrocarbon provinces in the global arena. For more information, visit www.azinam.com.